Large Teapots, up to 70 oz. Family sized teapots to serve a crowd. Teapots that hold more than 48 ounces. Suggested tea cozies are not included in the teapot price. Jumbo porcelain teapot. A great "party size" 70 oz teapot. This pot has a second handle up front for better balance when pouring. Use the #4 t-sac, or the cotton tea sock. 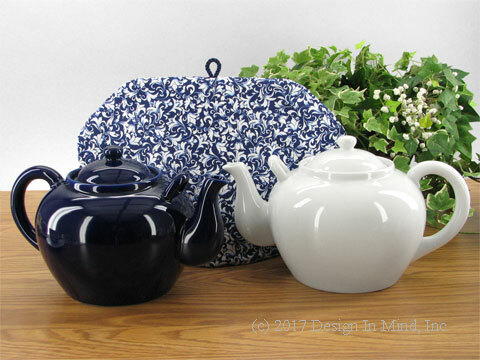 This teapot requires our new jumbo size Tea Quilt tea cozy shown here in Baroque Blue. For other available cozies, type the word jumbo in the search box. More choices are available by custom order in the Jumbo size, please email for details. Chatsford teapot in cream! The large nylon mesh infuser is excellent for preparing loose leaf teas. Available in four sizes. Chatsford teapot in classic rockingham brown! The large nylon mesh infuser is excellent for preparing loose leaf teas. Available in four sizes. Chatsford teapot in classic white! The large nylon mesh infuser is excellent for preparing loose leaf teas. Available in four sizes.